The Grand Canal is a canal in Venice, Italy. It forms one of the major water-traffic corridors in the city. Public transport is provided by water buses and private water taxis, and many tourists explore the canal by gondola. At one end, the canal leads into the lagoon near the Santa Lucia railway station and the other end leads into Saint Mark Basin; in between, it makes a large S-shape through the central districts (sestieri) of Venice. It is 3,800 m long, 30–90 m wide, with an average depth of five meters (16.5 ft). 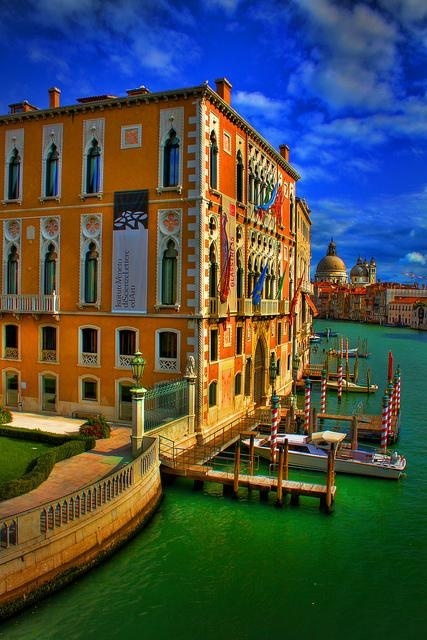 The banks of the Grand Canal are lined with more than 170 buildings, most of which date from the 13th to the 18th century, and demonstrate the welfare and art created by the Republic of Venice. The noble Venetian families faced huge expenses to show off their richness in suitable palazzos; this contest reveals the citizens’ pride and the deep bond with the lagoon. Amongst the many are the Palazzi Barbaro, Ca' Rezzonico, Ca' d'Oro, Palazzo Dario, Ca' Foscari, Palazzo Barbarigo and to Palazzo Venier dei Leoni, housing the Peggy Guggenheim Collection. The churches along the canal include the basilica of Santa Maria della Salute. Centuries-old traditions, such as the Historical Regatta, are perpetuated every year along the Canal.